KATHMANDU, Aug 26: Reconstruction work of the famous Krishna Temple at Patan has completed. 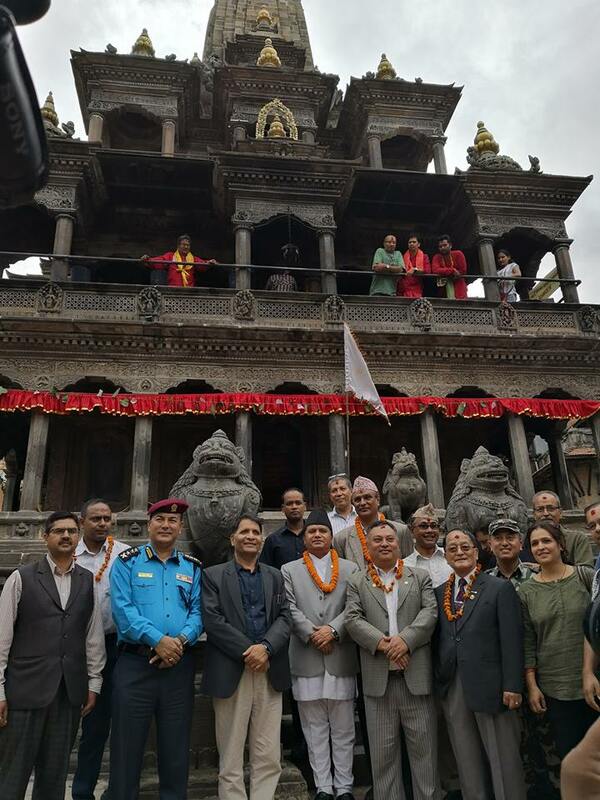 A special religious ceremony was conducted to mark the completion of the temple reconstruction which was attended by the Minister of Culture, Tourism, and Civil Aviation, Rabindra Adhikari, who said that Patan is a central attraction among the Kathmandu Valley's cultural heritages. Minister Adhikari spoke to the Mayor of Lalitpur Metropolitan City, Chiri Babu Shrestha, saying that the city will have the support of the central government in the preservation of Patan's heritage and its development. According to the Director General of the Archaeology Department, Bhesh Narayan Dahal, the Krishna Temple was reconstructed on a budget of Rs. 5.7 million from the Kathmandu Valley Preservation Trust. The Krishna Temple is seen as the most memorable structure in the Patan Durbar Square, which is listed as a UNESCO World Heritage Site.